The goal of this project was to find a new color for the "Motivations" cluster. I was responsible for managing the project and testing the color variations. This project was completed in two phases of one weeks: One week to find a new color and another week to apply the changes in all the mockups and specifications. Talentoday has a soft skill assessment that renders the personality and motivations results using 28 criteria and 6 clusters. Theses 6 clusters (Dare, Communicate, Adapt, Manage, Motivations, and Excel) have a different color. However the "Manage" cluster and "Motivations" cluster were both blue and sometime people confused them. The purpose of this project was to attribute a new color to the "Motivations" cluster. The previous 6 clusters of criteria. As you can see the "Manage" and "Motivations" colors were too similars. This project was completed in collaboration with my colleague Joy and the responsabilities were shared. During this project we did a lot of iterations and user testing. For financial reasons most of the user testing was done with people we knew or who were located in our office building. We asked about 30 people. We printed some of the iterations with a different print quality (High and low) and always checked the render on screens as well. We also removed the Orange color border on the test PDF to make sure that it won't influence the users. Joy and I discussed a lot with the rest of the team during this project. We wanted to make sure to involve everyone in the team. 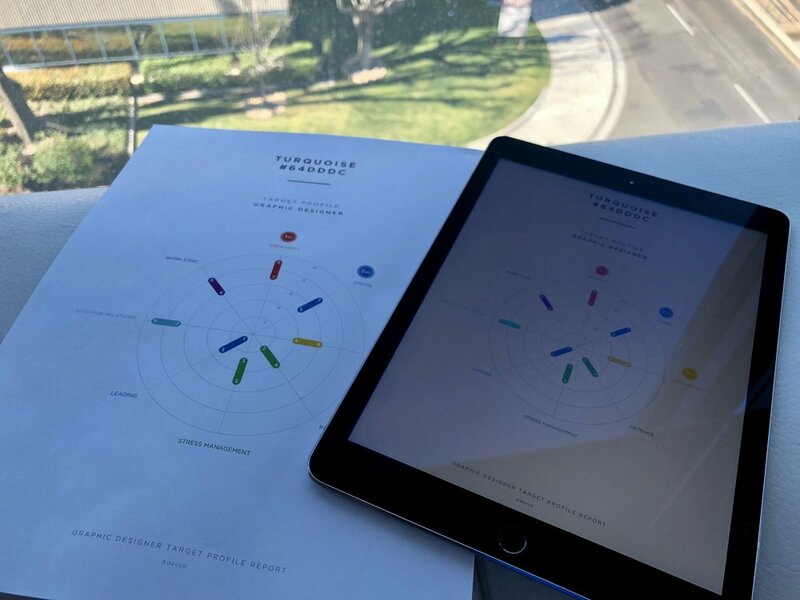 Using in-person meetings, video chats and Workplace, we asked multiple times the Talentoday team about which color they liked the most. On the last round, between pink, orange and gray they liked the orange color the best. After multiple reviews with the Talentoday Team and users we decided to use the orange. Although some options such as a darker blue or a dark gray were easier to read it wasn't a good option from a brand perspective. The executive decided that the orange, since it's one of the color of the Talentoday logo, was a better choice. As always we made sure to give rigorous and complete specifications to the developers about the changes to apply. You'll find below few of the illustrations that were send to the developers. An exhaustive list of every single location were an image or color needed to be change has also been provided.